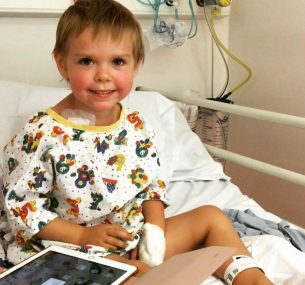 In June 2017, my daughter Sophia was diagnosed with acute lymphoblastic leukaemia (ALL) at the age of just two. 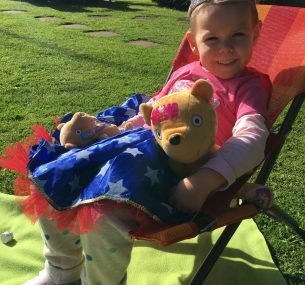 Sophia was immediately admitted to John Radcliffe Hospital where she received urgent blood and platelet transfusions. Over the course of those first few days, Sophia received fluids, pain relief and chemotherapy to which she responded really well. Unfortunately, we quickly learnt that where the leukaemia was so compact in her spine it had caused a compression fracture from T8-T11 of her back which meant Sophia remained unable to walk for many months. During these initial weeks Sophia and I stayed in hospital and eventually felt like residents! The team are amazing and we just couldn’t thank them all enough for their care and compassion. Finally the day came were we were discharged home and were able to enjoy the home comforts we had so missed. The treatment protocol for ALL is long and the adjustment of being home and giving a number of medications each day was a challenge. But eventually we became experts in our daughters care and needs. Over time Sophia became more mobile, crawling at first and then slowly standing. Her ‘first steps’ are a moment I will never forget. Over the next few months Sophia went successfully through each phrase of treatment and continued to do very well. We became frequent visitors to our local hospital with a number of admissions due to infections and chemotherapy induced fevers. All of these she dealt with without complaint although it was clear that this was taking a toll on our once confident little girl. The intensive stage was hard on her body and the severity of the chemotherapy became evident in January when Sophia suffered a seizure relating to a procedure she’d had the previous week. After being taken by ambulance to the hospital we had a 24 hour wait until we knew what had happened to our little girl. The worry of relapse never leaves you and this is what we feared most. During the wait Sophia was showing stroke-like symptoms and was unable to weight bare. The MRI results showed changes within her brain which continue to have a lasting neuroligcal impact on her day to day skills. Thankfully she was discharged and we once again tried to adjust to normal life once again. The chemotherapy continued to intoxicate her body to the point where she couldn’t grip a pen, walk and developed a persitent tremour in her hand which prevented her from getting food to her mouth. Following a detox from treatment the side effects started to reduce and seven months on we are very delighted to report that she is doing so well. There are many day to day challenges for Sophia but her fighting character means she never lets this stop her from living life to the full. 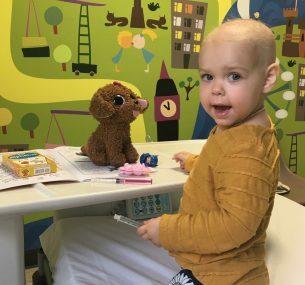 Sophia is in remission and will continue with treatment until September 2019. The treatment protocol is daily and every three months she will have a lumbar puncture with chemotherapy given directly in to her spine. We are so proud of her and we know she will continue to amaze us all – she is certainly a fierce fighter!